On Saturday, I started to notice that logins to the vSphere Web (Flex) Client stopped working with Google Chrome. Upon a successful logon, it would immediately crash with "Shockwave Flash has crashed" message. I had seen this message plenty of times in the past and usually restarting Chrome would resolve the problem but this time it looked to be persistent even after a system reboot. I took to Twitter to see if I was the only one hitting this issue since I was not able to find anything on the web and literally in minutes, I had several dozen replies with folks experiencing the same issue which apparently started several days ago but like most, including myself, thought it was an isolated event. After a bit of back/fourth and a few other folks chiming in, it looks like Google actually went and published a newer version of Flash (27.0.0.170) with latest Chrome (61.0.3163.100) update. This newer Flash version is not even available for download and the current version as listed on Adobe's website should be 27.0.0.159. This issue not only affects VMware products that uses Flash but any website that has Flash content and I had also noticed few others sharing frustrations on Twitter for other flash-based websites. Luckily, one workaround that I had found which others have also confirmed is to switch to Firefox which currently does not have this issue Its also been reported that latest updates from Firefox is also distributing the latest Flash which causes the exact same issue. Like most, Chrome is my default browser and it was annoying that I had to switch to another browser but that was the only way I could access the content I needed. Earlier this evening, I was looking at the VMware Reddit Channel and noticed a thread had popped up regarding this exact issue and it looks like more and more folks are now noticing. I had quickly glanced through the thread and thought there was not any new info, but then I saw an interesting comment from Reddit user theVelement who apparently found a nice workaround that would allow you to use latest version of Chrome with the vSphere Web Client. He found that if you still had the previous or even older version of Flash, you could simply delete the latest version and Chrome would function again. Disclaimer: Be be aware that the latest version of Flash (27.0.0.170) does resolve a major 0-day security vulnerability which is outlined here and reverting its affects can put you and your organizations at risk. Please use. One potential option to mitigate the risk of reverting the Flash version is to build a single jumphost VM that contains the workaround and ensuring it does not have any outbound network connectivity and limiting its access. This can be used temporarily to manage your VMware infrastructure that requires Flash until this issue is resolved by Adobe. UPDATE1 (10/16/2017) - It looks like you can also simply replace the new pepperflash DLL with an older version and placing it within the 27.0.0.170 folder (in case Chrome tries to update it). If you are looking for a working Windows DLL, it looks like one has been posted on one of the Chrome Issues thread here. Please be aware that the latest version of Flash (27.0.0.170) does resolve a major 0-day security vulnerability which is outlined here and reverting its affects can put you and your organizations at risk. UPDATE2 (10/16/2017) - For those wanting to disable the auto-update feature of Chrome, you can do so by changing the following HKLM\SOFTWARE\Policies\Google\Update\AutoUpdateCheckPeriodMinutes to 0. Thanks toChip Zoller for sharing this tidbit! UPDATE3 (10/16/2017) - VMware has just published KB 2151945 outlining the Flash issue which includes workarounds for both Firefox and Chrome. UPDATE4 (10/17/2017) - Adobe has published an update here regarding the issue and it looks like there maybe a beta release as early as next week. UPDATE5 (10/18/2017) - Adobe has just published a new beta build of Flash which includes both the security fix as well as the fix resolving the vSphere Web Client as well as other VMware-based products that rely on Flash (e.g. vCloud Director, etc). Depending on the platform, you may need to un-install the previous version of Flash and make sure you restart your browser. I just verified on my macOS system that I can now logon to a vSphere Web (Flex) Client without issues. UPDATE6 (10/25/2017) - Adobe just published a new Flash update 27.0.0.183 which looks to resolve the original issue. I have successfully verified this on both a macOS and Windows system. You may need to un-install the beta build if you had that installed, which you can find here. On my Windows system, I found that I only had the latest version of Flash. However, this system does have other user accounts and quickly going through another account, I found that it had an older version of Flash 26.0.0.151 which I was able to copy pepperflash DLL to the directory and then restart Chrome and the vSphere Web Client worked again! On my macOS system, I was lucky that it still contained the previous version 27.0.0.159 and once I copied the PepperFlashPlayer.plugin to 27.0.0.170 directory and restarted Flash, I was able to login to the vSphere Web Client. Although this is not ideal, at least for anyone who MUST use Chrome, there is somewhat of a workaround if you can find a previous copy of Flash. In the meantime, there has been no updates from Adobe but there is now PR being tracked on Chrome's public issue tracker which you can follow here. Huge thanks to theVelement for sharing the workaround! I had the same exact issue also with Firefox 56.0.1 and Adobe Flash 27.0.0.170. So it seems that the issue is with version 27.0.0.170 itself. I have installed older version 27.0.0.130 and everything is working as before. This is a copy of the old version to replace the new one, it works brilliantly thanks virtuallyghetto! Thanks @Matthew Bayley — that made it super easy as I didn’t have any old plug-ins laying around! Appreciate it! Disabling Google Chrome updates is a red herring. I have Chrome 59 with updates turned off, and flash still got updated. What you actually need to do is disable Flash auto updates. Thank you. I also had the same exact issue. The HTML5 release with all features can’t come soon enough! When I copy the older flash, and restart Chrome…it deletes the old version folder. Is there a trick to disabling the update? There have been flash/browser/plugin issues with vSphere 6.0 all year with Chrome and IE. VMware’s work-around was to run a handful of commands resetting the client plugin cert. HTML5 isn’t fully there yet, so the ongoing joke since 5.5 is that we’re just stuck with the flash client forever, and let’s hope it doesn’t crash in the middle of something important. Also having this problem, glad I was able to find your site & post! Unfortunately in my environment I don’t have the rights to change a lot of files or control app delivery, we just get what gets pushed out and have to live with it. Gotta love continuous update cycles, aren’t they great!!! VMWare needs to get on this and bring parity to the HTML5 client. It’s unusable for those running vSAN. It is strongly advised not to undo this update; it addresses an active zero day in the wild which can elicit full remote code execution. Weigh up the benefits of accessing any sites versus being fully compromised. CVE-2017-11292 for reference, associated with APT BlackOasis. Firefox is now installing Flash plug-in 27.0.0.170, so is experiencing the same problem as first seen in Google Chrome. Excellent discovery – I’ve been riming at Adobe and Google since Sunday morning! Without removing from the Internet Plugins folder it just reinstalls every time you restart Chrome. Just removing 27.0.0.170 plugin from the Application Support folder won’t do it. Well apparently Firefox has jumped on the “auto-update is a good thing” bandwagon because now I can’t run it in Firefox either. I cannot believe that in 2017 VMware still tells us to use Flash to manage our enterprise environment. What ever happened to re-writing vSphere client in electron? Or better yet – give us back a compiled Windows/Mac/Linux desktop application. Indeed – you would certainly want to maintain a vsphere-mgmt-only browser for now, that employed this workaround. It’s not ideal. OSX: I had to remove the folder from /Users/UserNameHere/Library/Application Support/Google/Chrome, copy in the ‘27.0.0.159’ folder and contents, then lock the folder from read/write otherwise Chrome would keep updating it. Had to do the same in Windows 10. Chrome just kept deleting and replacing with new flash. From my testing on MacOS, this affects all browsers running Flash Player 27.0.0.170. Folks may be seeing varying behavior such as “it doesn’t work in Chrome but works in Firefox” due to the fact that (on MacOS, for example), Chrome uses its own Google produced version of flash as a PPAPI plugin, whereas Firefox, Safari, etc. use the NPAPI installed Adobe Flash version (that on MacOS can be found in the System Prefs). I had to manually update the System version before the new version showed up in Firefox. In addition, vSphere 5.5 seems to work (6.0 and 6.5 (vsphere-client) crash). It has been a while since I’ve messed with Flash, but it may be that the 5.5 version is targeting a different version of APIs in the flash player, so 6.0 and 6.5 are tickling something that is causing the crash. Finally, I realize this is a stop-gap measure for most, but it isn’t clear at this point if Adobe/Google are even aware of this issue since it doesn’t affect all apps, and as such it is unknown when this will be fixed. 27.0.0.170 was rolled out as a patch for a zero-day exploit, so I would give a bit of pause before recommending that folks roll back the version they are running. (although with good security practices in place and most vsphere activity happening behind firewalls and via VPNs it is probably a relatively safe group). News regarding the zero-day exploit can be found here: https://www.bleepingcomputer.com/news/security/adobe-patches-flash-zero-day-used-by-blackoasis-apt/ Definitely keep and eye out for a fix if you do roll back! I couldn’t agree more with @Grant Fisher. Though I’m not 100% sure I believe even in version 6.5 there are still some dependencies on flash. For now I use VMware Workstation 14 Pro for administration tasks. There is no flash in the 6.5 vSphere *HTML* web client. 6.5 was released with a flash version (at https://vc/vsphere-client) and a regular html version (at https://vc/ui). Both run on the VC or VCSA servers simultaneously. The html client works great and is fairly snappy in my limited experience, and they put effort into making sure that there was minimal work for plugin developers to port over their plugins (*if*, that is, the developer used the HTML bridge technology that was introduced in 5.5.2). The downside, however, is that it is not yet feature complete. I *believe* that getting it to feature complete status is a high priority. You can get a few more features in the HTML5 interface by running the Fling (beta) version on a separate server that points to the vCenter: https://labs.vmware.com/flings/vsphere-html5-web-client. I’ve been using it for many months against 6.0 and 6.5 vCenters. It’s not functionally complete (no update manager, alarm actions, etc.) but is ahead of the officially supported version that’s baked into 6.5. If you don’t like running beta code, even 6.5U1 is a big improvement over the one in earlier releases. am i using windows 7 with vc 6.0, no such issue but wind10,8 yes. thats dropbox upload are working! thanks mat! and uninstall the current Flash Player from your local PC. Explore the contents of the “Update” folder and rename the “GoogleUpdate.exe” to “DISABLED_GoogleUpdate.exe”. To install the Flash Player browser plugin. To install the Flash Player for your Windows OS. 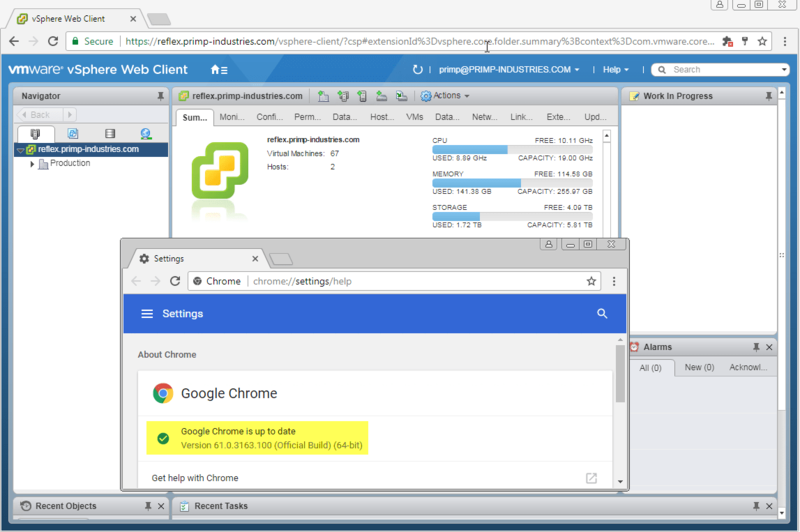 Open your Browser you wish to use to login to vSphere Web Client, enter your credentials and you should have access to the vSphere Web Client as before the Flash update. I tried the fix above and it worked! But after a reboot it seemed to break again are you experiencing the same issue? Hey Raj, yeah, experienced that same problem before. You have to implement Step 5. Disable Chrome auto update, of all the procedures of disabling Chrome update, the ones I documented is the only one I’ve found that worked and stick. I’ve tried registry key, scheduler task and neither worked for me, so please follow step 5 to disable Chrome update. Once you’ve done step 5, redo Step 8, I bet Chrome have already downloaded a copy of 27.0.0.170 in the %LocalAppData%\Google\Chrome\User Data\PepperFlash directory, so delete it, that is the PPAPI that is causing this crashing issue with vSphere Web Client. Once you’ve completed Step 5 and Step 8, you should be good again. The method of disabling Google Chrome update I documented above is very easily reversed either by reinstalling Google Chrome or rename the GoogleUpdate.exe back and Chrome will auto update again. So don’t reverse the Google Chrome update back until Google release a fix to the 27.0.0.170 PPAPI Flash Player, otherwise you’re gonna have that crash problem again. Vincent, these steps worked great. After the updates, Chrome DID still alert saying that it had an outdated version of Flash and offered to update it, but you can bypass that option by just clicking on the “run this time” button to run with the old version which then works fine. Thanks so much, you’ve saved me! Thank you. You save my day! Problem fixed! So grateful for your post William! This has been driving me nuts. Problem fixed. Chrome updates can also be disabled in scheduled tasks – my Win10 system didn’t have the reg keys above. For Mac OS user, you can download the previous version (https://fpdownload.macromedia.com/pub/flashplayer/installers/archive/fp_27.0.0.159_archive.zip) and run the uninstaller (uninstall_flashplayer27_0r0_159_mac.dmg) i wil also work for uninstalling v170, then install the flashplayer27_0r0_159_macpep_pkg.dmg. this should fix the issue. Thanks all for the info, great stuff, but we need to get on VMware to get a flash-less adobe-less web-client going. We can blame flash all we want but we have been warned that this is going away… just saying. Same issue on windows 10 (1703) and IE 11. Uninstalling update KB4049179 (contains version 27.0.0.170) reverts flash to version 26.0.0.137. Now i can access the vsphere webgui again! 4. start portable-Chrome with this cmd. That works for me. Note that this is an unsupported solution. Thank you, great work around. FYI: The download link below in VMware’s KB article results in a 404. Not sure if bad URL or download file was removed. Thanks VG! I hit this issue a number of times and also concluded that it had to be a problem, that’s what led me here. To resolve it, I had to use Microsoft Edge which does work but I don’t like using Edge, I prefer Chrome. Do we really want to push installing a version of flash with a known issue that is being actively exploited where you most likely use administrative privileges? Second, item, Microsoft has released the flash patch for windows and now IE is crashing. Flash Player 27.0.0.180 (beta) fixes the vCloud/vSphere crash and is now available from the Adobe Labs. Another possible workaround is this fling from VMware. It was fairly easy for us to setup and seems to work well for temporary use until Adobe releases a stable update. Struggled with this using a WIN OS and finally realized that I had to remove/update or add the pepflashplayer.dll file provided by VMWare in 3 locations within my WIN 10 OS. I then turned off Auto Updates for Adobe Flash Player and also disabled and stopped the Adobe Flash Player Update Service within the WIN 10 Services menu. I was getting the same issue. – Same error in Chrome. – Flash would crash in Firefox. – Internet Explorer 11 would just crash. You’d never have this issue with the C# Client! Anywho, I installed the beta Flash Player for ActiveX and IE is working again. I’ll go through FF/Chrome now to resolve the issue. Agreed! I was also able to use the Beta version to finally get Chrome operational. Sigh. Fixed my issues with Chrome and FF so thanks for the post! The Beta version solved the issue. It also look much faster than before. Did anyone notice the same behavior? Chrome has closed out the bug because Adobe has fixed it. Just install the latest beta release of flash and you will not have the zero day security issue and this will start working again. The best solution is to have a thick client and not rely on 3rd party libraries/applications. Thanks William, greatly appreciated !!! I called vMware yesterday and they were not aware of anything ! Of course, why bother with the customer’s needs. I still cannot believe vMware continues to push their miserable web https flash web application. Wake up bvMware and get your act together ! Same issue my end not only for crome as well Mozilla Firefox too. Just keep in mind to allow your installed flash (beta) to get access to the vCenter Server webclient site. Everyone, Adobe has released a beta to fix this issue. The adobe patch fixes a 0-day exploit that is being actively attacked. You should immediately update to the beta and stop putting your systems at risk. I added the vsphere URL to the ALLOW list in the Chrome Flash settings. mine appears to be working with chrome now. Folks – Heads up, it looks like Adobe just published v27.0.0.183 (https://get.adobe.com/flashplayer/) which looks to resolve the issue. I’ve gone ahead and un-installed the beta build and have verified on both my macOS and Windows system. Thank you for share the info.!!!! Flash update 27.0.0.183 fixed it for me!!! !